Loizos Apartmens is the best choice for your holidays because its location and the facilities it offers make it an ideal residence as your relaxation can be combined with the entertainment opportunities of Santorini. Here in Santorini, the most beautiful Cycladic island, 100m from the center of Fira town, the bus station and the unique Caldera, the block of LOIZOS includes apartments and studios. There is easy access to all sandy beaches of the island. Places of interest like shopping centers, cafes, taverns, restaurants, nightclubs and the breathtaking view of the volcano, for which Santorini is famous, are all within walking distance. In a friendly atmosphere with the best service and reasonable prices, we promise to make your holidays in Santorini an unforgettable experience! Our staffs are friendly, helpful, well informed and well trained to meet your needs. in every age. We would like to thank you for your interest in our hotel and we expect you in a pleasant and family environment for unforgettable holidays. Guest rooms have all the refinements expected of a fine apartments.The rooms are equipped with every convenience to guarantee a memorable vacation. Kitchen, Refrigerator, Bathroom, Music, Direct dial telephone, TV set, Air condition, and free transport from port and airport to the Hotel. Είστε ιδιοκτήτης ή διευθυντής στο LOIZOS STYLISH RESIDENCES; Εγγραφείτε τώρα για δωρεάν εργαλεία, που μπορείτε να χρησιμοποιήσετε για να βελτιώσετε την καταχώρησή σας και να συνδέσετε την ιστοσελίδα σας και το σύστημα κρατήσεών σας. 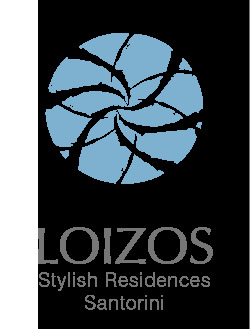 Loizos Apartments combines reasonable prices & an excellent location. 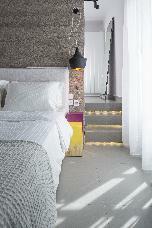 The hotel is centrally situated - Fira, the capital of Santorini Island. Just seconds away is a breathtaking view of the Caldera & Volcano.Accommodation types include rooms, studios, superior studios & apartments. The hotel caters for clientele of all ages, friends, couples & families. The friendly atmosphere & good service goes hand in hand with a promise to make your holidays in Santorini an unforgettable experience. Within two minutes walk one can discover the enchanting world of Santorini island, quaint cafes, a multi-choice of restaurants, art galleries & local shops. And just down the road is a large local supermarket, the main bus & taxi terminal, Fira square, banks, museums, the local bookshop & the post office. Loizos Apartments also offers a new swimming pool, complete with sunbeds and umbrellas - perfect for a quick dip in the hot summer sun.Loizos Apartments offers hotel accommodation for 1-4 persons.